In the last week, I will announce how you can enter to win my top pick from this series. I can’t wait to see if you love my favorite as much as I do. Do you think you know who the winner is yet? Let me know in the comments below and let me know if you have your own favorite red lipstick. 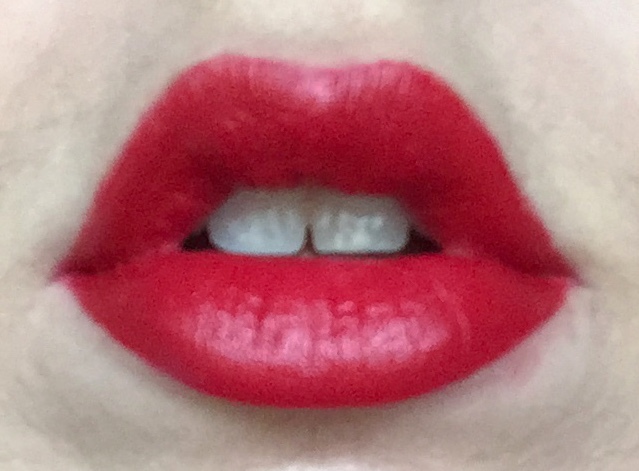 By this point, I think it is pretty obvious that I love Bite Beauty lipsticks. While a select few shades haven’t been my favorite, any lipstick within this brand is a pretty safe bet. This one is no exception. I love that it is extremely pigmented and a beautiful blue toned red. The formula on the pencils feels a little thick but not in a bad way. It is still very comfortable to wear and has the added bonus on not bleeding into fine lines like a slicker or thinner formula tends to do. No lip liner needed for this one. This was a lipstick that has been hanging around in my collection pretty much unused… and its a shame. I really enjoyed wearing this lipstick. I would describe this color, without a lip liner underneath, as watermelon. I think the shade is pretty unique. Unfortunately, I found the formula to be a bit sheer and felt it needed the liner underneath to punch up the intensity. I do not care for sheer lipstick in shades of red. In the future I’d like to find a liner that is a closer match to the actual shade of this lipstick. This is yet another lipstick that I see in my lipstick drawer all the time, and have continually pushed aside. I have a feeling it is because I have another lipstick by Pat McGrath in this same packaging that I really don’t like. Why would you keep a lipstick you dislike, I hear you saying. Well… it’s PAT MCGRATH! She is such a talented artist and I want to love everything she does. The moral of this specific story though, don’t judge a book by it’s cover. This one It actually really nice. It was very effortless. The pigmentation is outstanding, the color is vibrant, and it wears really well and comfortably. All around a pretty great lipstick so it’s a shame I’ve ignored it for so long. This was one of those shades I had a hard time deciding whether or not to include as a red. It’s sort of more of a dusty rose. I decided to include it anyway. It was similar in a way to the Smashbox lipstick earlier, in that it is more sheer and really requires a lip liner in order to even it out and add some much needed (in my opinion) pigmentation. Overall though it was a nice lipstick to wear, I don’t have anything negative to really say about it but there isn’t much to get too excited for either. Somebody please tell me what the trick is to applying these. I struggle so much to make these look even and to carve out my lip shape before it starts drying down. As soon as it starts drying, I find you CANNOT try to add more on top. That is when the real patchiness happens. I did mange to make this one look pretty even but it was still difficult and a too stressful. Maybe I just need more practice because there are so many people out there that love them. I am determined to figure this application out. I will not be defeated by this formula. These deep shades of lipstick are notorious for being difficult to formulate and/or apply. This one is no exception. I’ve worn a few shades in this formula now and we all know that I struggle with the application but this one was by far the hardest. This was the best attempt, which isn’t saying much, before I just got too frustrated to continue. I also immediately took it off. *sigh* some day I will figure this out.